Joel Selwood lead the Cats out for a record 143rd time today, breaking Reg Hickey's record. GEELONG has marked its return to GMHBA Stadium with a commanding 47-point win over St Kilda on Sunday. The Cats turned the tables on a leaky defensive start to the season with Daniel Menzel's electric second quarter setting up the 15.13 (103) to 7.14 (56) victory. The 27,338-strong crowd were left stunned in the second term as Saints defender Dylan Roberton collapsed with no opponent in sight. He walked off the field, but was later taken to hospital for tests on a suspected irregular heartbeat. 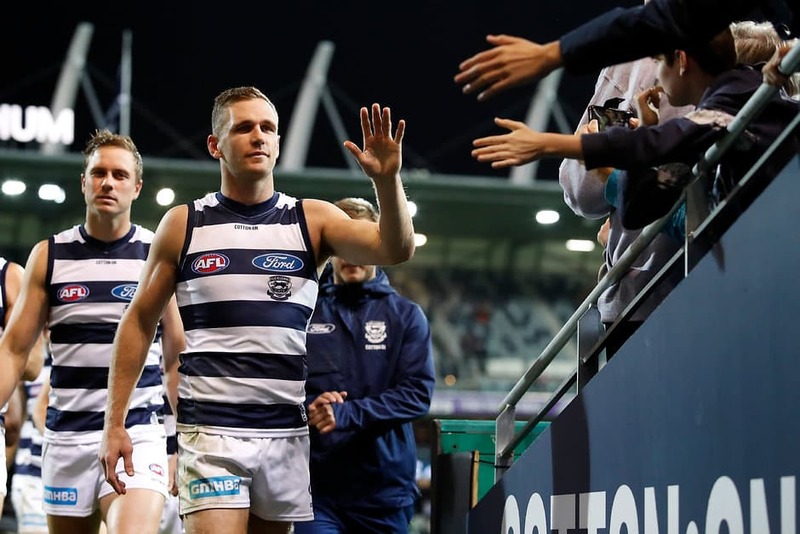 On a night when Joel Selwood became Geelong's longest-serving captain – leading his 143rd match – youngster Brandon Parfitt (28 possessions and three goals) emerged as the generation-next in a midfield missing Gary Ablett. A makeshift Geelong defence – which saw utility Mark Blicavs take St Kilda big man Paddy McCartin – was left with little to do, conceding 44 inside 50s, 18 less than their season average. Forward Rowan Marshall joined Roberton on the sidelines after suffering a concussion in the second term with the Saints reduced to two rotations and little chance of overturning their poor record in Geelong – an average losing margin of 81 points in their last three visits. As coach Chris Scott called for Geelong to ramp up its attacking presence, Menzel was the beneficiary of a season-high 62 entries to finish with five majors. Scott was pleased his side was able to make it 18 wins from their past 20 matches at home with 10 players with less than 35 games AFL experience. "We got the game on our terms early," Scott said. "To continue to play the way we wanted to as a team with that inexperience was a positive. "It's one thing to be able to do it at training, but to deliver on the big stage when there's a bit of pressure is another thing. To this point, those guys are delivering, it's exciting for us." St Kilda coach Alan Richardson conceded Roberton's injury played on the minds of his players but refused to use it as an excuse for the loss. "We were beaten pretty badly by the Cats tonight, their physicality and their pressure was just too much for us and that's disappointing," Richardson said. "Probably 90 per cent of their score would've come off our turnovers. "Part of that was their really good defence, they did a really good job in terms of the way they structured up behind the ball and we weren't able to cope with that. Menzel kicked the final goal before the first break with Geelong lucky to take a 17-point lead after three missed set shots from Jack Billings, Jarryn Geary and Marshall. From there the floodgates opened as Menzel kicked the first three goals of the second term to help his side to a 29-point buffer at half-time. Patrick Dangerfield (25 possessions) joined Selwood (27 possessions) in a dominant display over St Kilda's midfield, while Zach Tuohy (29 possessions) set-up countless attacks from the back half. Saint Jake Carlisle was forced to spend time forward in the second half to counter Marshall's loss with the small forward brigade of Ben Long, Jade Gresham and Jack Lonie starved of opportunity and combining for one goal. Outnumbered throughout, McCartin had a turn of luck late in the second term as he kicked his first goal since round one from beyond the arc. Running back to goal, Blicavs appeared to have touched the ball over the line, but a major was awarded despite replays showing a perplexed Blicavs got his hand to the ball before the line. Blicavs' defensive partner Tom Stewart (eight marks) channeled mentor Matthew Scarlett, patrolling the defence alongside Jake Kolodjashnij. Cat Rhys Stanley and Saint Tom Hickey shouldered the ruckload for both sides who are yet to settle on their preferred option this season. It took Stanley's goal in the 23rd minute of the second term to break the possession deadlock between the pair. Geelong: Cory Gregson failed to take any part in the second half after a foot complaint in the second term. Defender Tom Stewart spent time on the bench on multiple occasions with a leg injury, while Patrick Dangerfield finished the match with ice on his left calf in what is likely just a precaution. St Kilda: Concerning scenes in the second term when defender Dylan Roberton collapsed on his own accord with no opponent within 10 metres. He was able to run off the ground but was later taken to the Epworth Hospital in Geelong for tests on a suspected irregular heartbeat. Forward Rowan Marshall was ruled out of the match in the third term with concussion, sustained from friendly fire from teammate Jack Billings. The Cats have a second interstate trip in three weeks when they travel to Adelaide to take on the Power on Saturday night. The job doesn't get any easier for St Kilda, hosting Greater Western Sydney at Etihad Stadium.